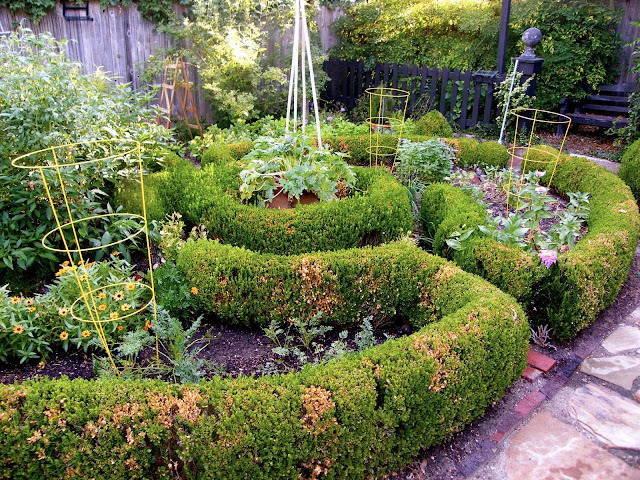 'Wintergreen' boxwood is the medium for the sculpted hedge of the potager. of clipped boxwood leaves that fell into my garden boots and stuck to my sweaty feet and in between my toes......bet you thought I was gonna say rose petals, huh? For I am an absolute box-a-colic when it comes to this beautiful, glossy and versatile evergreen. 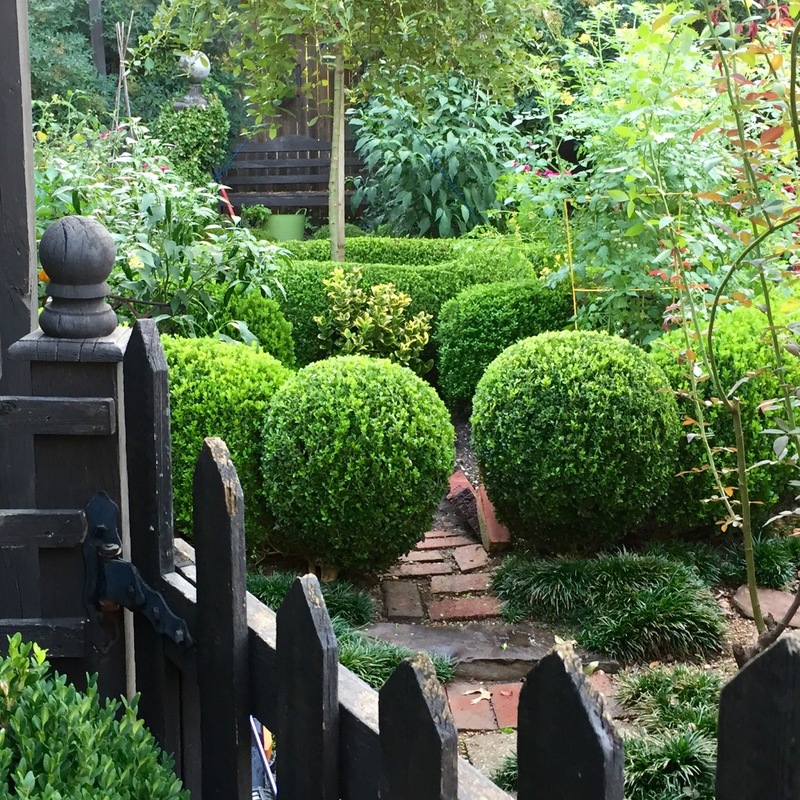 I have never met a boxwood I didn't like, and currently have over ten varieties growing in my beds and containers. But without question, some varieties perform far better in our often harsh and temperamental southern Oklahoma climate, so here is a round up of my favorite, and in my garden at least, best performing boxwood varieties. Extreme heat, over 105 for days on end with not a drop of rain, severely stressed the boxwood of the kitchen garden. after an unbelievably brutal summer (2011, I believe) of heat and drought. But with tending and frequent pruning, regular rainfall in subsequent years, and a benevolent Mother Nature, it bounced back to its now glorious state. Being a fast grower helped this recovery, of course. But that is also the downside of 'Wintergreen'. It requires frequent clipping to remain in good and tight form and is demanding in this regard. On the upside, this variety is less expensive, and being a fast grower will quickly form a tight, grown-together hedge. My potager border was entirely planted from one gallon containers years ago, and over time shaped into its present form. Two petite 'Green Beauty' boxwood balls serve as finials to the small brick landing of the garden bench. 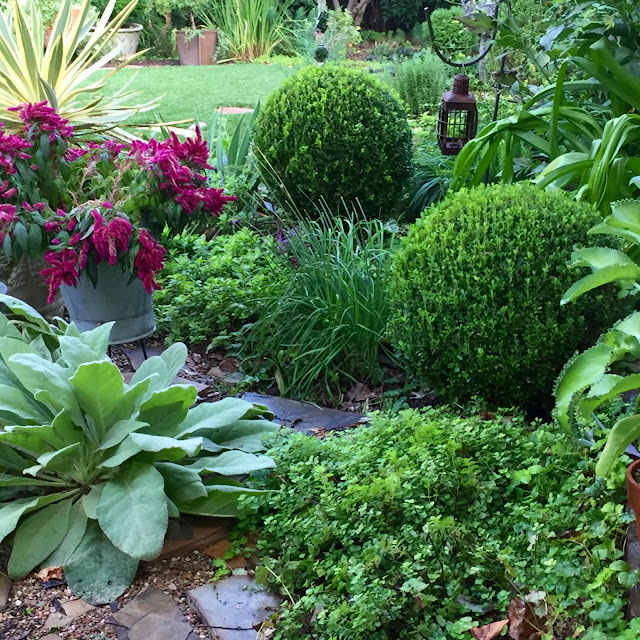 The poodle topiary in the foreground is clipped Eugenia. Both 'Wintergreen', a Korean boxwood, and 'Green Beauty' a Japanese boxwood, are characterized by their bright, almost kelly green rounded leaves, and especially glossy foliage... (read more about their differences here at SF Gate)...a wonder to behold when spring or fall light bounces off their rounded, shiny forms. Both varieties can handle full sun to partial shade...though admittedly prefer afternoon cover during the hottest parts of the year. Remarkably unfinicky, handling both frigid and torrid temps. Like all boxwood, they can be prone to spider mite, so keep this in mind. Be on the watch for speckled markings and treat to both prevent and address infestations. I try to use a dormant oil spray each early spring for just such eventualities. 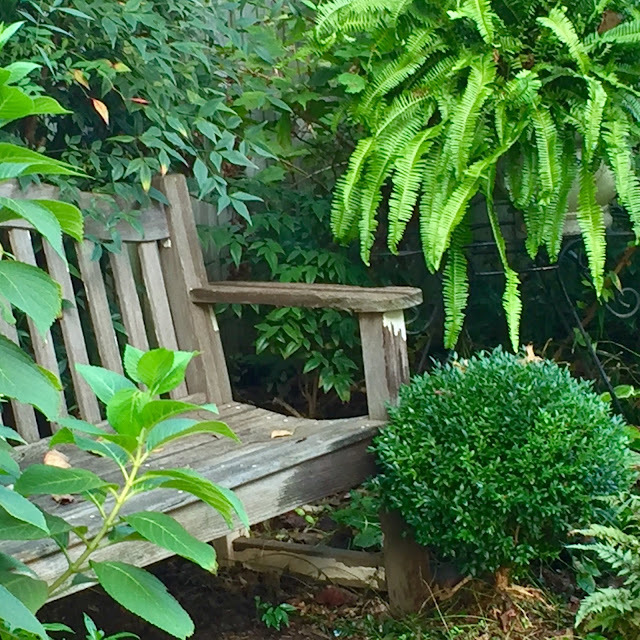 A sphere of Green Mound Boxwood sits patiently at the foot of my garden bench. For easy care with minimal pruning, excellent naturally rounded form, and deep, rich green foliage, try 'Green Mound'. Because of its easy care nature and growth habit, and ability to handle both full sun and fairly dense shade, it is one of my favorites. The leaves are bit smaller and more pointed, making it a subtle counterpoint to other varieties of box, if that is a design effect you are trying to achieve. In the image below, note the nuanced, but still obvious differences between the large 'Green Mound', the smaller and glossier 'Green Beauty, and the deep lustrous green of 'Winter Gem'. 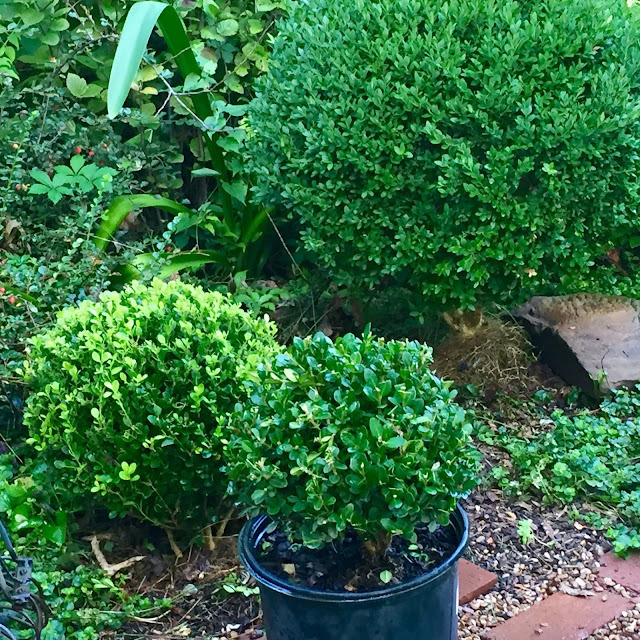 Three varieties of boxwood balls keep company. 'Green Mound', 'Green Beauty', and 'Winter Gem'. Think of this boxwood stalwart as a kissing cousin of 'Green Mound', but growing naturally into a taller, more conical shape. It too performs well in both sun....and shade, particularly if kept frequently pruned so as to maintain its shape and density of foliage. 'Green Mountain' positions itself between a Steeds Holly and pendulous pot of an orchid over summering outside. 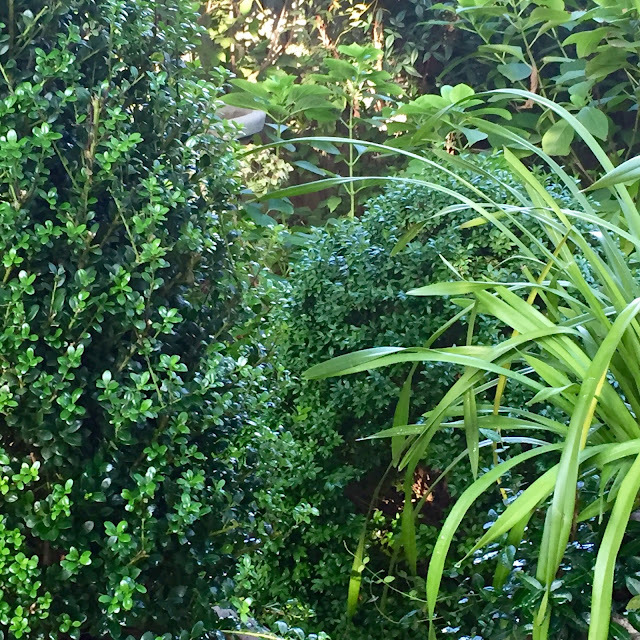 compact boxwood excellent for use in smaller gardens for borders and focal areas. Densely branched, the tiny, green foliage is abundant and adds a distinctive note to the landscape, retaining its color particularly well in winter. The moderate rate of growth makes these boxwoods ideal for carefree edging in a wide area of the US. Other splendid characteristics include deer resistance and tolerance of dry soils once established. This winner is another staple in my garden. Monrovia (here) describes its growth habit as rounded, moderately fast grower, topping off at about 3-4 feet. I have used it extensively in my front landscape, where its deep hue and rich winter color make it a boxwood classic. But we all start out small at one time, and these baby ones in the image below are happy to reside in small pots until their mistress decides otherwise. Clipped, gallon size Green Velvet boxwood is root pruned to fit into smaller pots for a pleasing little vignette. Thank you for taking time out of your busy schedule to stop by Potager! If you don’t want to miss a post, you can sign up to receive a daily email and you will never miss a thing. I’m also on Facebook, Pinterest, and Instagram. Or missed a 4 YOUR GARDEN segment? Go here. 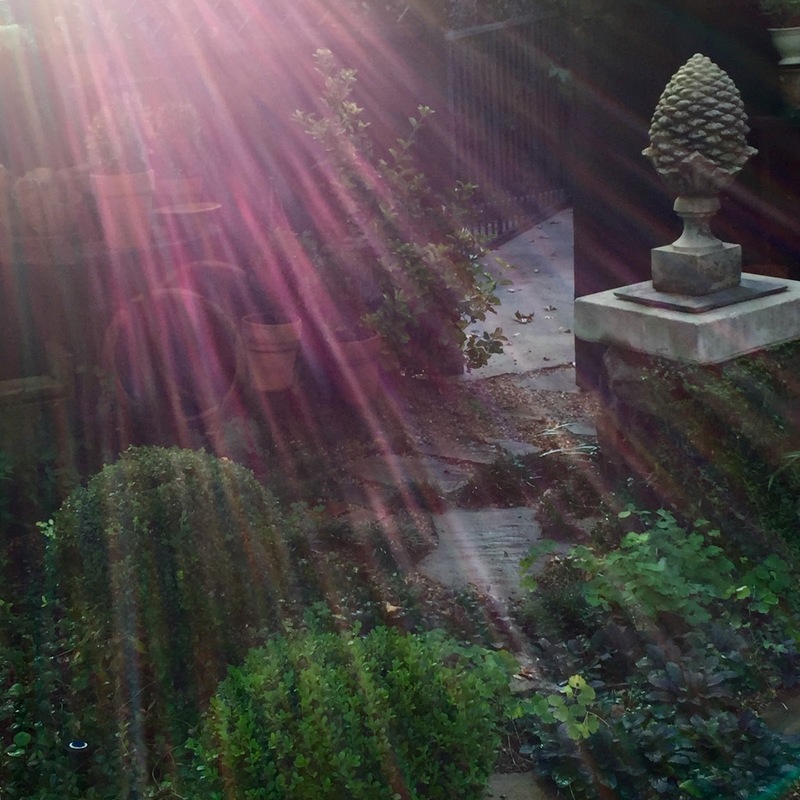 Also, don't forget that the OKLAHOMA HORT SOCIETY'S ANNUAL GARDEN TOUR is coming up on October 1. Find out details and ticket locations here. I hope to run into you!